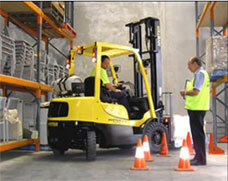 Forklift operator certification is not only mandated, but creates a safe environment for your company and staff. Keep your business in line with Hyundai Forklift of Southern California's complete training and forklift operator certification program. This quality program, which complies with OSHA regulation 29/CFR 1910.178, has proved successful at certifying hundreds of operators. Available in English and Spanish - and at your location or Boman's - the forklift operator certification training program provides each operator with Forklift Operator Safety Training documents, a wallet operator's ID, certificate and test results. Should you use an electric forklift or LPG? The answer depends on where you do your business. If you're outside in the rain, an LPG is needed since the electric forklift will short out when wet. On the other hand, if your work is in exceptionally cold weather, an electric forklift is the choice. Plus you'll discover that an electric forklift is much quieter than its LPG counterpart, even though it needs recharging. A leader in material handling solutions, Hyundai Forklift of Southern California offers an affordable selection of new, used and reconditioned fork lifts. Our quality fork lifts line proves a smart choice with reasonable pricing and expert technicians. You'll find all the fork lifts your business needs - from Toyota, Hyster, Nissan and Clark to gas fork lifts, electric fork lifts, pneumatic tire fork lifts, cushion tire forklifts and even narrow aisle reach fork lifts.